It was time for a winter get-a-way to someplace warm. It was also a great opportunity to see my sister again. 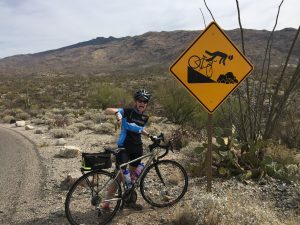 We decided on Tucson where we could relax and visit for a few days before I went on another Backroads biking trip. Susanne thought the last time she had visited was 2007, the final year my parents spent the winter there. For me it had been much longer. We spent most of our three days trying to remember where they had lived or where we had eaten and shopped. Susanne and I had a great time together, but it felt bitter sweet as we remembered time with our parents who are now several years gone. Our stay at the Westward Look Wyndham Resort, nestled in the foothills part of town, was comfortable and convenient. We hiked in Sabino Canyon on a warm and sparklingly clear day. We poked in funky shops downtown and ate in some great restaurants. We each had a slightly embarrassing incident – Susanne lost a beautiful hand-crafted earring she had just bought earlier in the day. Amazingly she found it on the ground outside my room the next morning. I somehow dove into the pool with my glasses on and didn’t even realize it until I got out of the pool and couldn’t see. Miraculously, a man paddling around in the pool felt them with his foot and retrieved them for me unharmed. Very lucky outcomes for both of us. The Backroads bike trip was as supportive and luxurious as ever. We spent two nights at the elegant Tubac Golf Club and Resort south of the city, and two nights at the sumptuous Ritz Carlton Dove Mountain, a bit to the north. It was a big group, 24 guests and four guides, so there were plenty of new friends to be made. I had requested a roommate and was paired with Teri, a delightful dentist from Vancouver. We were two peas in a pod and had a great time together: “I like it freezing at night”; “me too!! !” There were several men travelling alone and several single women, and couples who didn’t ride together, so it was easy to interact with different people on the road and at meals. I mostly ended up riding with the stronger riders who did the longer routes each day. The first day in wine country – yes, they have vineyards in the desert – was a beautiful route through rolling hills and big sky. The weather was delightful, sunny and warm, but not too hot. The second day we road 26 miles uphill into a really strong headwind. It was hard to look at the beautiful scenery while battling a front coming through. I opted out of the afternoon ride and instead, poked in shops in Tubac, trying to remember when I came here with my parents. I wasn’t tempted to buy any of the beautiful artwork, because I have most of these things in my house and yard, salvaged from my parents’ collection. The third day, after a tour of some cool caves, we road in Saguaro National Park on one of the top ten bike routes in a National Park- a well-deserved reputation. The loop road twisted and turned through the amazing forest of cacti and provided challenging ups and thrilling downs. Some of us had a close encounter with a grey fox, who shouldn’t have been on the road in the day time. The rangers went after him, but that didn’t stop me from going around the loop road a second time. The afternoon ride featured a challenging climb up part of the famous Mount Lemmon. After enjoying great views of the city, 16, 2018 we breezed back down for a total of 50 miles for the day. The last riding day led us on more busy roads with good bike lanes through the city of Tucson. Not my favorite kind of riding. After lunch we headed out to the Desert museum over Gates Pass. That was challenging and scary on a bumpy, narrow, twisting road with a lot of traffic. I felt pretty strong by now, but took my time, slow and steady. By the time we arrived at the museum, 49 miles later, it was starting to rain. I took a brief walk through the beautiful grounds, again remembering when I was here years ago, but then opted for a beer and munchies in the van on the way back to the Ritz. The rain didn’t keep me from the gorgeous hot tub at the hotel. Teri and I were staying in an amazing little casita up the hill from the main hotel. We asked a bellman from the front desk to fetch us in a golf cart for dinner. Plenty of tequila made for a festive farewell meal. Steady rain on the last morning cancelled the scheduled rides and hikes. After a relaxing sleep and leisurely breakfast, I went on a walk in the rain and found some of the trails leading up into the canyon. I didn’t want to venture too far in sandals and an umbrella, but the cacti looked beautiful in the fog and mist. A long but uneventful travel day got me home around midnight after a wonderful break. This entry was posted in Biking, Family, Food and Wine, Travel by Martha Elliott. Bookmark the permalink.